We are a leaders in providing our customers a wide assortment of Aluminum Composite Panels. Manufactured using high quality aluminum, these products are checked on all the set industry standards. Our customers can avail these products at a nominal price. Established at Delhi, we, Rainbow Contracts India, are one of the leading Manufacturers, Traders and Suppliers of a vast variety of Fabricated Structures. These are manufactured in compliance with industrial standards of quality as per the specifications furnished by the clients. We have established our worth in the market by offering a qualitative range of products to clients at leading market prices. 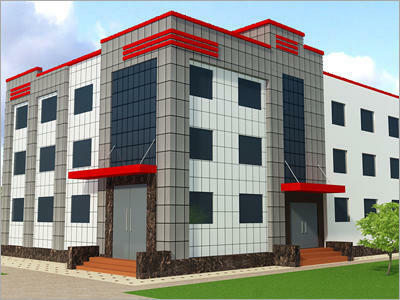 We undertake fabrication work for different structures as per the requirements of the clients. Structures such as Aluminum Composite Panel, Fabric Shelters, Glass Mosaic Tiles, Office Containers, Portable Cabins and Prefabricated Buildings are available to clients at economical market prices. These are known for their excellent quality, durability, damage-resistance and ease of use. Our products are manufactured using advanced manufacturing technology in compliance with industrial quality standards. Our talented and skilled manpower has helped us efficiently cater to the requirements of our clients with utmost ease.